Disembark and transfer to the airport for your flight to New York (flight not included in land only bookings. Book flight after 12:30pm). Day 21 - Gettysburg – Washington D.C.
Day 22 - Washington D.C. Journey to Nashville or “Music City” the home of country music. Since its inception, Nashville has been linked to music, from Davy Crockett to Miles Davis, from Bob Dylan to Beyoncé, the best of the best come here to learn and share their art. Get a taste of this incredible city with a walk along the famous Honky Tonk Row. You’re Invited: Take a guided tour of the Ryman Auditorium, followed by dinner and a show at the legendary musical institution, the Grand Ole Opry. You’re Invited: Tour the recording studios of Music Row, including Studio B where some of the greats of country music have recorded. Afterwards, feel like one of the greats and get in front of the microphone to record your own song. We then visit the Country Music Hall of Fame that houses one of the best collections of country music memorabilia, instruments and costumes in existence. The rest of the day is free to explore Nashville, the “Music City”. Travel to Memphis, the blues capital of the world. Visit Graceland, the home of “The King”, Elvis Presley. Explore his mansion and see his private costumes, gold records and awards. You’re Invited: Head to B.B. King Blues Club and get a taste of some true southern rock and blues. Enjoy B.B. King’s favourite southern dishes as you listen to the best of Memphis music. Tour the famous Sun Studio, known as the birthplace of rock ‘n roll. Explore the memorabilia and hear fascinating stories of fame and fortune, excess and success. The rest of the day is free for you to discover Memphis. 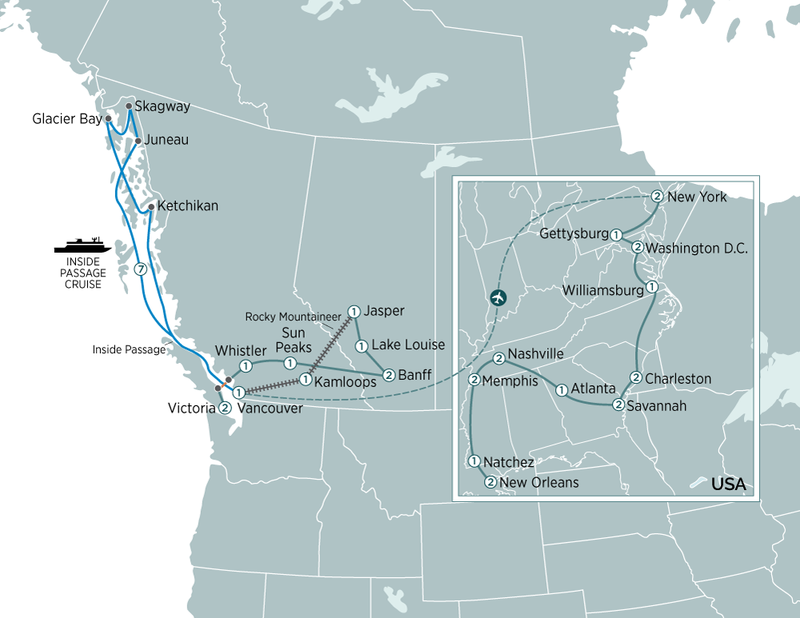 Follow the great Mississippi River south through the heart of a nation. You’re Invited: Visit Frogmore Cotton Plantation and Gins where you will learn both the modern and historical stories of a working cotton plantation. We’ll then listen to some traditional gospel music that tells the trials and triumphs of life on a plantation. In the evening arrive into the town of Natchez with a wonderful collection of antebellum architecture. You’re Invited: Tonight you will be hosted for dinner by the 5th and 6th generation homeowners at Glenfield Plantation. Continue to Oak Alley Plantation, an opulent and beautifully preserved antebellum mansion. Wander through the magnificent landscaped gardens lined with old oak trees and take a tour of the elegant mansion. The afternoon finds us in the vibrant city of New Orleans. The last stop on our tour takes us through another musical genre, Jazz. Steeped in a history of influences from Europe, the Caribbean, Africa and beyond, New Orleans is home to a truly unique melting pot of culture, food and music. Our local guide joins us for a tour of the French Quarter, the oldest neighbourhood and cultural hub of the city. Visit an historic cemetery, referred to as the “City of the Dead,” and learn about this unique above ground burial system. Then visit St. Charles Avenue and the Garden District which is home to some of the best preserved Southern mansions in the country. You’re Invited: Set sail on the Mississippi River aboard a traditional steamboat. Savour the beauty and romance as you dine on a traditional southern meal while relaxing to some smooth Jazz tunes. After breakfast you will be transferred to New Orleans Airport for your onward flight. Discover More: French Quarter tasting tour, or Airboat swamp tour (Note: Due to a late finish, post tour accommodation is required to undertake the tasting tour and is also recommended if doing the Airboat tour, additional cost). Ascend Sulphur Mountain in a gondola for a delicious breakfast with views over Ban? Mountaintop breakfast experience in Ban?